28th GPNDG at MaryHill State park, WA. 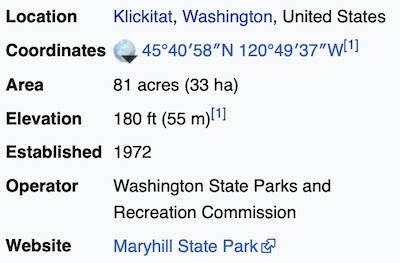 Maryhill State Park is a 99-acre camping park with 4,700 feet of waterfront on the Columbia River in Klickitat County. The area is significant for its natural beauty, its access to the surrounding natural wonders and its cultural history. A full-scale model of Stonehenge stands near the park. 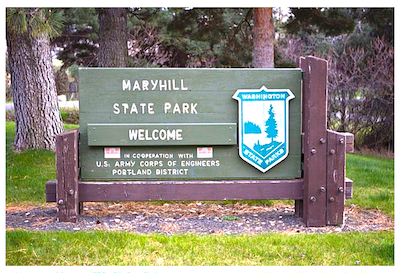 Maryhill State Park was acquired by lease from the U.S. Army Corps of Engineers in 1972 at no cost. Sam Hill, considered a local eccentric, built a "castle" for his daughter, Mary, on a hill, and named it "Maryhill." He designated the beautiful building, originally designed as a family home, as an art museum before the end of its construction. Mr. Hill built a full-scale partial replica of England's famous Stonehenge one mile from the state park. [Unfortunately, when Sam Hill copied Stonehenge he didn't get it oriented like the original, with respect to the compass]. Both Stonehenge and the Maryhill Museum of Art are open to the public. Approx. 30x50ft post & beam. Glass on southwest, otherwise open half-walled. Close-by large concrete fire-ring with some seating. 8ea 8ft aluminum nice picnic tables. NOT chained down. NE wall has ~8ft butcherblock countertop with sink. Cold water only, must hold to keep on. Good drain. Center island 3x8ft butcherblock counter. AC outlets both sides. No water at center island. 10 overhead outdoor lights on beams with breaker-box in corner. No AC outlets at breaker box - light control only. This shelter is almost as good as Crescent lake, better in some ways. The area where the words Group Camp are printed is dry scrub waste. The Group Camp is both sides of the sidewalk shown between the shelter and restroom/bathhouse. That sidewalk is about 100yds long. It's not a small place. The two gray areas with white circles are parking lots for Group. No power or water around outside periphery of parking lots, only on the central camp area side. 2 trash dumpsters in north lot. Empty space for 2 more at West lot. Men: 1 sink, 2 urinals, 1 stall (ADA), 2 showers (1 ADA), 1 AC outlet. Women: 1 stalls (1 ADA), 2 showers (1 ADA), 2 sinks, 2 AC outlets. Propane tank adjacent indicates hot water. Showers are coin-operated, quarters only, $0.50 for 6 minutes. No paper towels or wastebaskets - air blower hand dryers. There is another bathhouse in center of RV area. Similar specs. Men: 3 sinks, 3 stalls, 2 urinals, 2 shower stalls, large changing area. Women: 5 stalls, 3 sinks, 2 showers, 8 changing booths. 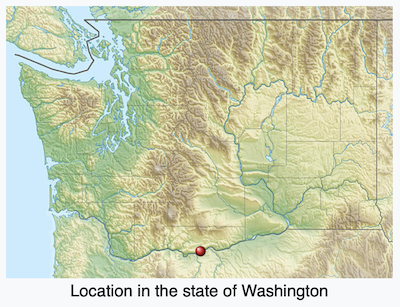 The digram shows less than one-half of the total E-W extent of the park. The rest is a very, very nice, green, shady day-use area and swimming. beach with shelter, bathhouse, etc. adjacent east of the RV camping area, AND THEN to the east of that even more day-use area for fishermen with boat launch, another shelter, picnic tables, lots of shade. When we were there, it was not windy. Sunny and slightly cool. 259.1 miles from our house in Spokane. GPS altitude at river: 150ft. No gas 82 miles eastbound on WA 14. We noted many bees (honeybees?) in the shelter area.